Satcoms (Satellite Communications) is the generic term for communication via satellite. Transmitting a signal from the earth upto a satellite and then receiving that signal back at a different location on earth. The satellite does not have to be a huge expensive array of electronics and solar panels. In fact the moon was used, in the early years of satellite research, to bounce the signals off. The time it took for our signals to get to the moon and back was about 2 seconds. This time is called satellite delay and is still present today in all our satellite communications. It is the time taken for the transmission to get to the moon or satellite and then be bounced or transmitted back to earth. Another phrase for this time is the Turn Around Time. The ability to transmit your signal upto such a high relay point and then receive it again back on earth allows us to receive it where ever we are in the world as long as we can see the relay point or satellite. Taking the moon as our example, as long as we can see the moon then we can point a dish at it and receive the signal. This wide range broadcasting ability has given rise to a multitude of different satellites carrying all kinds of information such as telephone calls, television channels, internet traffic, military communications, weather data, Global Positioning signals, Earth ans Space observations and even radio stations. Well, this can be a massively complex and confusing subject, so to keep things simple I will use a simple analogy: The Torch. Take a torch, and switch it on. The light bulb is our signal generator, be it voice, data or whatever you want to transmit, imagine those signals being the light from the bulb. The reflector behind our bulb is our antenna or dish. Now if you have a particularly good torch you will notice that the light is not sent in all directions but is focussed into a beam. The beam is our satellite transmission. Next, find a white wall. A small white piece of card is perhaps better for this analogy, 10cm by 10cm placed high up in the room or on the wall... aim the torch beam at the white card. The card is our satellite. Now comes the bit that gets hard to visualise. 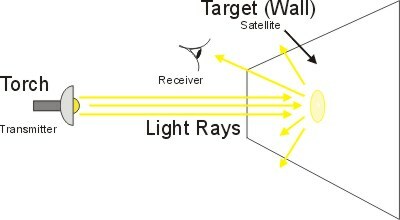 If you can see the light on the card, then you can see the satellite and if your eyes are the receiver then the light is travelling from the torch to the card and is then being reflected or bounced back and spread out over a larger area and your eyes are receiving the light where ever you are - as long as you can see the card. So in a satellite communications system we have a signal generator of some sort. This is usually a modem (modulator/demodulator) which takes in digital information, such as digital TV pictures, and modulates it (mixes) onto a signal carrier for transmission and can also demodulate (separates) the data from a received carrier to produce the data or digital TV picture. Then we have a transmitter and a receiver amplifier for two way communications. If we were only receiving we would only have the receive side of the system, this is why our satellite TV boxes are small and affordable. It is cheaper to receive than it is to transmit. Next we have our antenna. We point the antenna at the satellite and we can receive a signal. We can also now send our signal to the satellite if we are able to transmit. The satellite also has an antenna, receiver, transmitter and often another antenna. The signal it receives is at a frequency we will call 'A' but it will move this signal to frequency 'B' before sending it back to earth. This is so that we can keep our transmit signals separate from our receive signals. Otherwise, our receiver may pickup our own transmit signal and be swamped by it. The difference in these signal frequencies is known as the translation frequency. The transmit frequency is translated into a receive frequency. In terms of size our transmit signal is huge compared to our receive signal because it has to go a long way to the satellite. About 36,000 Km is the average distance it has to travel for a geostationary satellite. This is also the reason why our receive signal is so small, because the satellite that sent it is 36,000 Km away. 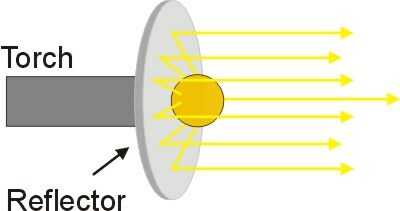 The receiver has to amplify this signal without amplifying the noise, in a way our eyes do exactly that. Rain and weather generally also affects the signals. Rain, and the atmosphere generally, can reduce the size of the signal by half, this varies depending on where in the world you are. So now we can send out our signal and we can also receive someone elses.